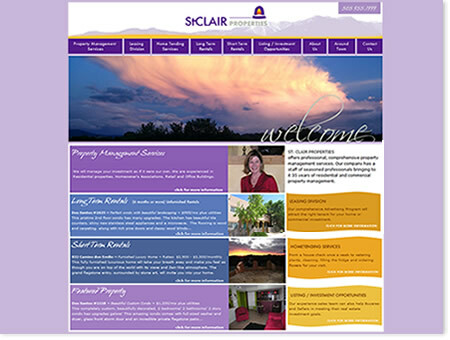 St. Clair Properties came to us as a result our design and development work for Santa Fe Realty Partners (www.santaferealtypartners.com). Suzy needed a fresh new presence on the web from which to market her client’s listings of for sale and for rent properties. We first created a brand the reflected Suzy St. Clair’s vibrant, nurturing, and creative approach. After we had created her logo, business cards, stationary and yard signs, we built the site that reinforced her new brand as well. This project was fun because we not only got to work with one of the best agents in town, we were able to market the amazing lifestyle people in the Santa Fe area experience. Suzy’s had amazing results from the site because of its easy access to information and high search engine postings.